On a winter night three kittens are thrown in a sack into a garden. Luckily they can escape the cold by entering the house, which they explore. This sweet cartoon contains elaborate gags with a.o. pepper, a bottle of milk, and a pianola. ‘Three Orphan Kittens’ was penned by Joe Grant and Bill Cottrell, and benefited from Fred Moore’s appealing animation. Indeed, it won an Academy Award. Its success made it one of those rare Silly Symphonies to evoke a sequel (‘More Kittens‘ from 1936). 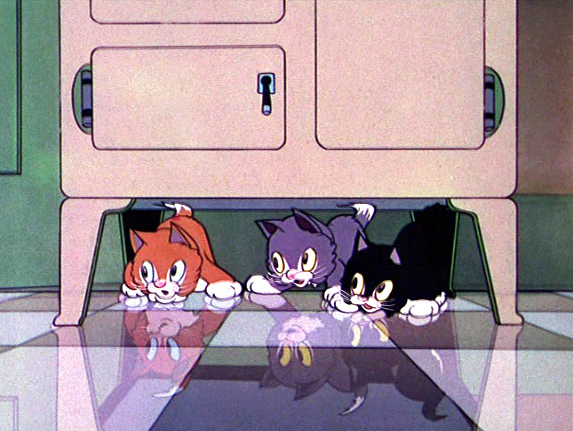 Moreover, it clearly inspired other animation film makers: the milk bottle gag was more or less copied by Fleischer in ‘We did it‘ (1936) which also stars three kittens. And, some of the pianola gags may have inspired Hanna and Barbera in their ‘The Cat Concerto‘ (1947). At least Hanna and Barbera copied the black maid (of whom we only see her arms and legs) for their own Mammy Two-Shoes in the Tom & Jerry series. The black maid would also return in a few Disney shorts: ‘More Kittens‘ (1936), ‘The Pantry Pirate‘ (1940, starring Pluto), and ‘Figaro and Cleo‘ (1943).